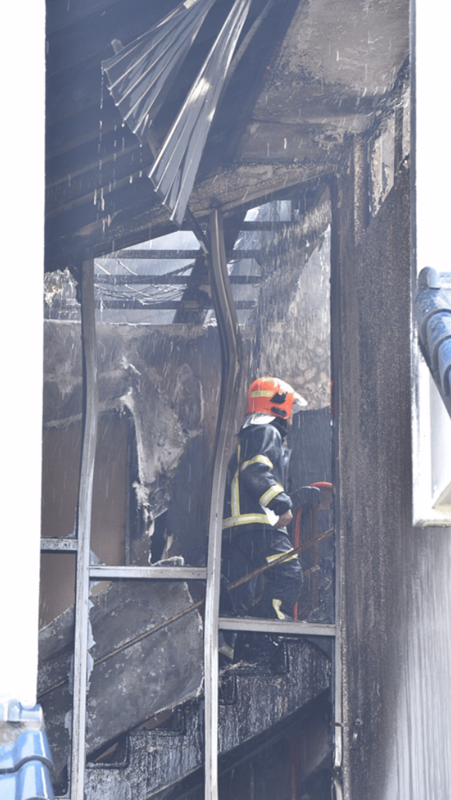 SINGAPORE - A fire broke out at Pre-school By-The-Park in Shelford Road on Tuesday morning. There were no reported injuries. The blaze started on the ground floor of the three-storey semi-detached unit and spread upwards, causing part of the roof to collapse. Mr Ma Xiu Yan, 66, a resident at the block of apartments behind the semi-detached unit, which houses the pre-school, said he was woken by the fire alarms in his building at around 7.30am and the residents evacuated to the ground floor of the complex. The Singapore Civil Defence Force was already on the scene putting the fire out. “It became a big fire and the roof collapsed. But no one panicked. I don’t think anyone was inside the school because it was early,” he said. At around 8am the residents were able to return to their homes. The SCDF was alerted to the fire at 6.50am, and sent two fire engines, two red rhinos, an ambulance and two support vehicles to the scene, a spokesman said later. Officers put out the fire within one hour using three water jets inside the house. Two more jets were set up outside to prevent the fire from spreading to the adjacent house and to surrounding buildings. Damping down operations continued in the afternoon, where officers kept the burnt surfaces wet to prevent the fire from reigniting. When The Straits Times arrived at around 8.30am, SCDF officers were using water jets to reduce remaining smoke. Staff from the school who were standing outside the premises did not want to comment on the cause of the fire, but said no one was hurt, and that parents had been informed of alternate arrangements for their children which is believed to include sending them to the other branches. Pre-school By-The-Park has two other branches at Dunearn Road and Li Hwan View, according to the school’s website. The Straits Times understands that children usually start getting dropped off at the premises from 7am, while classes start at 9am.